With iOS and OS X on an annual release cycle, some Apple watchers have expressed a desire for a “Snow Leopard” moment this year. But what does that phrase even mean? How does it apply today, six years after Mac OS X Snow Leopard was announced? Snow Leopard was a better Leopard. The release was full of refinements and little touches. 10.6 brought new under-the-hood technologies to the Mac that the platform relies on today. Exchange support was added to the Mac with 10.6, after being added to iOS previously. There are a sea of complexities under those three tentpoles. Serlet claimed that 90% of the projects within OS X were refined between 10.5 and 10.6. QuickTime X and Safari 4 shipped with the OS, and things like Grand Central Dispatch, OpenCL and much more robust 64-bit support all shipped with Snow Leopard, as well, no to mention Exchange support, which was a big step forward for the Mac in enterprise environments. This was a risky strategy for Apple. After the rapid-fire updates of 10.1, 10.2, and 10.3 followed by the riot of new features and APIs in 10.4 and 10.5, could Apple really get away with calling a “time out?” I imagine Bertrand was really sweating this announcement up on the stage at WWDC in front of a live audience of Mac developers. Their reaction? Spontaneous applause. There were even a few hoots and whistles. Many of these same developers applauded the “150+ new features” in Tiger and the “300 new features” in Leopard at past WWDCs. 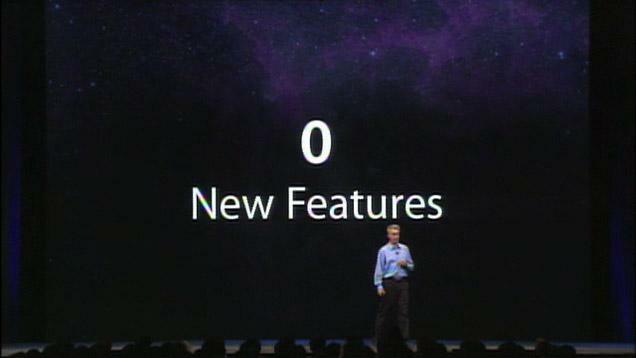 Now they were applauding zero new features for Snow Leopard? What explains this? Snow Leopard was heralded as a “love letter to Mac developers.” The phrase surfaced again last year, and was thrown around a lot after WWDC 2014, and for a long list of good reasons. Swift, third-party keyboards, Extensions, TouchID APIs, better notifications and more showed up with iOS 8. The difference between iOS 8 and Snow Leopard is that former brought many user-facing features, while the latter only really had one: Exchange support. While it’s possible that all of these things will make it into the Keynote, it’s a whole hell of a lot of stuff to talk about. Everything on that list is exciting, and with Apple on the hook for annual releases, chances are iOS 9 and Mac OS X 10.11 are just around the corner. The problem is — of course — that Apple may be stretched too thin. Pundits have said that for years, and that bulleted list a few paragraphs up is a little frightening in that regard. I don’t think the market will let Apple slow down on iOS, however, The space is competitive, and Android is looking better and better each year. It’s interesting to think about what a Snow Leopard moment for iOS could look like. Apple could tidy up the new features in iOS 8, and polish the rough bits, turning iOS 8 into a mature mobile operating system not a mere rung in the iOS ladder to the sky. Likewise, I’d be fine with OS X slowing down a bit. While the yearly release cycle keeps things fresh — and in step with iOS with features like Continuity — but it feels like just about the time each version of OS X gets good and stable, a new version comes down the pipe. Chances are, of course, that my dream of a slower 2015–2016 cycle won’t come true. The pragmatic thought is that some of this stuff will get a mention at WWDC, but Apple will follow-up later in the year in more detail. This summer — like the past several — promises to be busy for those of us in the Apple space. I’d like a breather, but I don’t think we’re going to get much of one.